Looking to upgrade your course syllabus this term? Maybe Professor Pam Mork’s example can help. She teaches General Chemistry at Concordia College in Minnesota. Ghastly, in retrospect described Pam’s reaction. Actually, her syllabus is probably a lot like most of ours. As such, it serves as a perfect mini-case study for the upcoming term. Pam’s challenge was simple: Make the course inviting. Having read my Amazon bestselling ebook, Create an Engaging Syllabus: A Concise, 7-Step Guide for Professors, she implemented several ideas, four of which we’ll share below. Pam was able to alter the language in her course description to be more student-oriented (note: check with your department first, as some have strict requirements). She opened with the question on every students’ mind: Why would anyone want to study chemistry? Why does a muscle contract? Why does a campfire warm us up? Why are fireworks different colors? Every breath we take is a chemical reaction. Every morsel we nibble is metabolized in a chemical reaction. Every garment we don is created in a chemical reaction. We can’t escape chemistry! In my ebook, I discuss how master marketers use the acronym AIDA (attention, interest, desire, and action) to connect with their target audience. It’s about packaging information. Framing it. Think of this analogy: Beef manufacturers could say their product is either “75% lean” or “25% fat.” Both are flip sides of the same coin. But the former resonates with customers more than the latter. Sometimes academics don’t like to think this way. They think it’s spin. In reality, it’s just effective communication, something we strive for when writing articles and conference proposals. 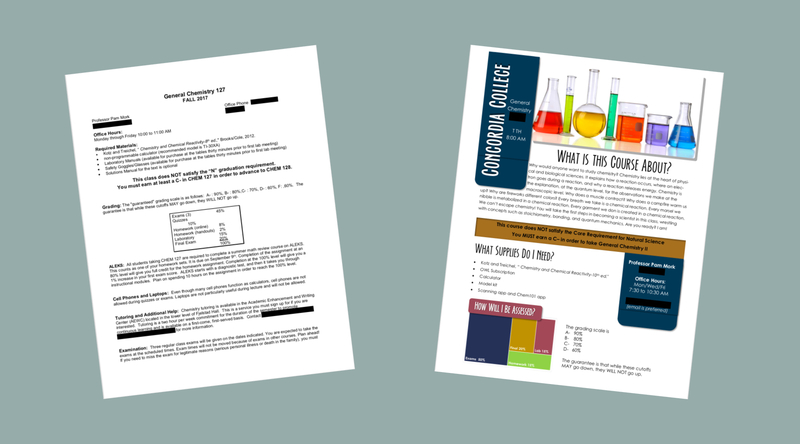 With General Chemistry, Pam presented her course in a way that students will see its value and utility. That’s the premise of AIDA. How might you incorporate attention and interest? Are All Atoms of an Element the Same? How are Chemistry and Chinese Alike? How Do We Know How Much NaCl is Dissolved in a Beaker of Water? For a reader, it’s potentially a small, yet positive moment (more on this later). As you plan your topics this term, think about framing your topics. They don’t have to be posed as questions either. The session 8 topic in Pam’s syllabus, for instance, provides some intrigue: Let the Reactions Begin. Better than writing Chapter 8: Chemical Reactions, no? When students take your course, I’m betting most of them wonder things like, What’s considered an “A” in this course? Or thinking, I have no idea what this professor is like. Pam got creative. She shows us what an “A” student looks like, what a “B” student looks like, and so forth. If I’m the type of student who “arrives right before class starts”—as Pam describes in the middle box, last bullet point—at least I’d know what she values: students who come early and skim their previous notes. The professor has modeled student professionalism up front. But it’s easy for us to judge. Instead, I hope readers sees the underlying and valid idea she’s implemented: managing student expectations, a critical skill all educators need. Most times, students will adjust to your teaching approach—whether you grade “hard,” stick to the policies, or assign tough papers—as long as you don’t surprise them. That’s what Pam has done here. On the left, Prof. Mork makes her feelings on plagiarism known, without getting too technical. 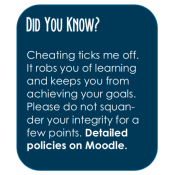 I’m a big fan of putting the “fine print” elsewhere—either in the back of the syllabus or online whenever possible. Out of the prime real estate area, so to speak. Such micro-experiences shape the way students see you and the course. So, as you plan your syllabus, think of the series of improvements you can implement, which — taken together — will intrigue and inspire your students. Side Note: I avoided talking about visual or graphic design. Most of us simply aren’t trained in this area, so we do the best we can—including me. Pam was kind enough to share her syllabus—or more accurately, her syllabus for that particular semester. No doubt she’s continued to refine it over time—to make it look and sound even better. So I refrained from commenting on color schemes, layouts choices, and other “design”-type elements. My hope is that this syllabus can open a dialogue to improve the level of our collective syllabi. Click below to view images of Prof. Mork’s revised syllabus. You can toggle between pages using the arrows at the bottom of the images. Note that Pam separated her six-page syllabus into two parts, saving Part 2 to hand out mid-semester as to not overwhelm students on Day 1. Something to think about. Warm and constructive comments are highly encouraged! Even better, share your syllabus below. 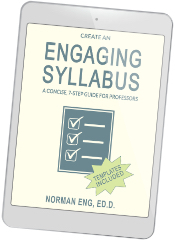 To download my free ebook, Create an Engaging Syllabus, go HERE. Perfect timing! I am updating my syllabus and wanted to really change the way I communicate with students. Starting with getting them excited and drawing them in. Right now, I feel like students don’t really read my syllabus, and truthfully it probably comes across pretty dry. Looking forward to implementing the questioning technique and revamping the course description. Keep writing these kinds of posts! Celia, the syllabus is students’ first impression of us, so coming across as enthusiastic and helpful is so important. Would love to hear how you end up! I implemented your syllabus guidelines based upon you eBook and then purchased your book. I am reasonably happy with my revamped syllabus with its new focus on the student vs. the old style CYA the teacher contract version. Nowadays I find it a little awkward to talk about myself but, left in the About Me blurb in the end. I noticed Pam left that out. 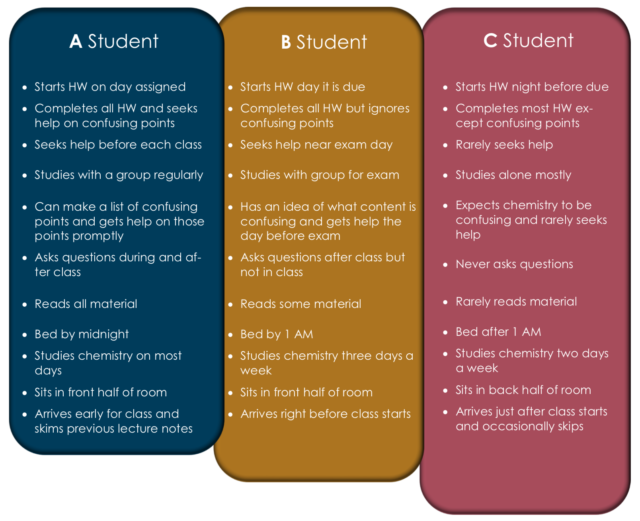 Do yo think student really care about that section? Do they really want to know there teacher on a personal level? I was recently contemplating the history of the traditional course syllabus as I work on my online courses, so this blog was timely for me. I am going to survey students to determine whether or not they read the syllabus file. I have noticed some students primarily use the learning management system (LMS) App to access information about the course. With this knowledge, I am now going to add more web-based syllabus content in the LMS for my face to face course. I enjoy creativity and making content visually appealing. One of the things I am realizing is some of the things I have created were not accessible. Consider the importance of adding alternative text to any images in a document. Some students may also have problems seeing color. Personally speaking, while I am not color blind, there are certain color combinations I cannot read. The good news is there is a free resource: WebAIM Color Contrast Checker that can be used: https://webaim.org/resources/contrastchecker/. If we use a number of images to describe content, it may be easier for accessibility purposes to create two different documents. Thanks for this Alex. Many colleges have accessibility requirements (for examples all icons have to be labeled with text so they can be read by a screen reader). I’m hoping my next ebook update will include more details to address this important issue.